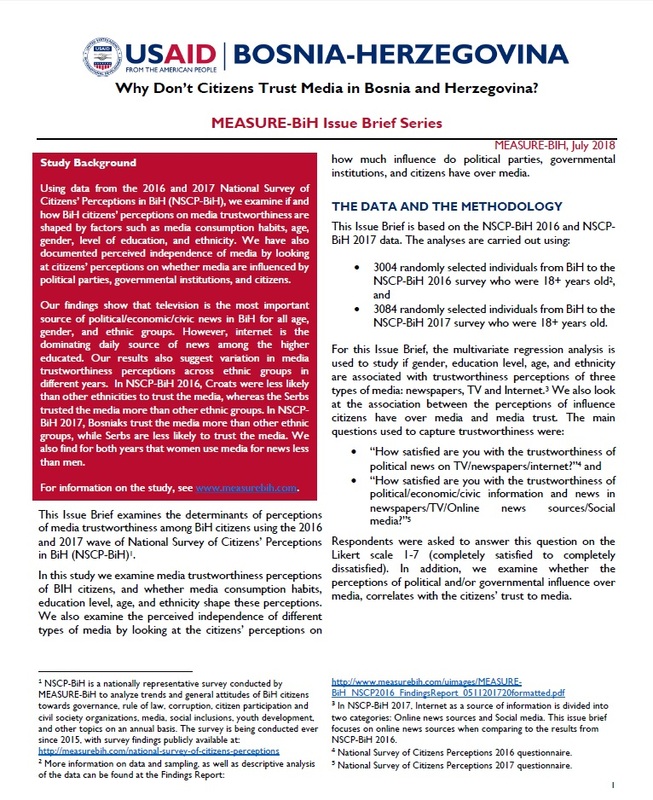 On December 14, 2016, MEASURE-BiH launched the Research Support Program as part of its efforts to help develop BiH program evaluation and social science research capacities. The Research Support Program helps to assess the viability of innovative and interdisciplinary research topics/projects proposed by the Research Fellows, supports selected research ideas/projects to "proof of concept” stages, provides advice to identify and develop potential funding sources, provides specific guidance on the process of getting papers accepted by international conferences and journals, provides training on academic English, and technical writing and help to identify and connects Research Fellows and U.S. university faculty members on demand-driven basis. The remaining two issue briefs are still in the process of developing, and will be publicly available upon their finalization. Together with our Research Fellows, we will further explore options of potential support activities to generate demand for evaluation and evidence-based policy making among the BiH government institutions. MEASURE-BiH Research Fellows are invited to submit their ideas, proposals and suggestions, based on which further activities under the Research Support Program are designed and implemented.